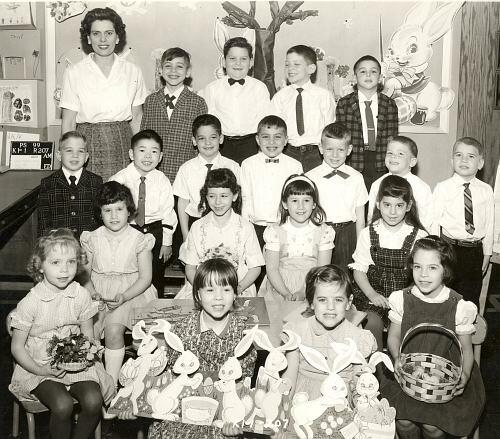 A Picture History of Kew Gardens, NY - Class Pictures - PS99 Kindergarten 1 1962. Please email me if you can identify any of the other students. Front row: Linda Frizzell, Kathleen McGrath, Toni Goldschmidt and Alice Kantor. 2nd Row: first on left is Meryl Kass (? ), second from left is Gloria Tarantino, third from left is Ruth Wachspress. Last row: teacher, David Lillian, Adriaan van Laarhoven, ?, and Lenny Block. "Hi there, The little boy in front of the bunny rabbit on the bulletin board was my brother Adriaan van Laarhoven. He was good friends with Lenny Block. The teacher is Mrs. Bernstein and her daughter, Miss Bernstein, taught my second grade class."